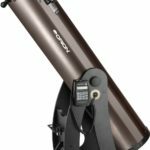 The fantastic Celestron NexStar 4 SE telescope offers a cleverly constructed instrument based on the Maksutov Cassegrain optical design. 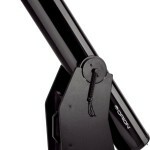 Apart from the attractive appearance of the NexStar range with its stunning and easily recognizable metallic orange optical tube, this telescope which provides you with the magnifying power of a telescope with a 1200 mm long focal length, but compresses the optical components into an optical reflector tube just 330 mm long. The Celestron NexStar 4 SE is one of the most compact and portable telescopes on the market, yet offers superior optical performance. The wide aperture of 100 mm makes for truly stunning magnification and bright, clear images. The Celestron NexStar 4 SE Reflector telescope delivers great views of the Moon, the planets, and bright deep space objects, which represents excellent performance from a 100 mm aperture telescope, but if you expect to see much further, then you may want to scale up to a bigger model. 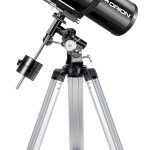 However, the real winner for me with the NexStar range of reflector telescopes is the superb computer controlled automation which is included with this precision instrument. 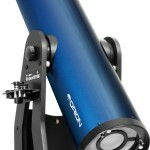 So in addition to the attractive features, the Celestron NexStar 4 SE offers still more to the budding or experienced astronomer due to the advantage provided by the computerised alignment and tracking system on which this telescope is based. The patented SkyAlign computer technology is coupled to a motorized alt-azimuth mounting platform, which is fully automated by computerised control and takes all the hard work out of aligning and tracking the telescope. Is it difficult to aim the telescope? SkyAlign means you do not need to line up the telescope yourself. SkyAlign means you do not need to use a finder scope for alignment. SkyAlign means you do not need to manage the tracking of the object, and no longer do you have to manually adjust the telescope to keep the object in focus. With the power of computer automation all you need to do is enter the date and time. With a very rough aim – you still need to aim it approximately at 3 object the right area of the sky – the telescope is ready and the computer takes over and does all the hard work for you. SkyAlign is completely automatic and to set it up, you can select any target object from the database, and the telescope will do everything for you, from aiming, to tracking and ensuring a sharp focus on the object no matter how fast it tracks across the sky, or how long you want to maintain your field of view. 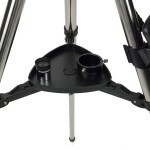 Not only is the computerised alignment a huge plus with this telescope, but the software that comes with it is very useful, informative and easy to use. The computer will give you the names of the target stars, and allows the telescope to find thousands of objects such as stars, planets, and galaxies by just pushing a button. Needless to say, by using the computer automation, you also have the bonus of much more accurate tracking than you can do manually, and prevents the wobbles caused every time you try to ‘gently’ adjust things. Just when you thought that was everything you needed to know, SkyAlign has an even better set up feature whereby you can navigate with the “Align with any Two Stars” or “Align with Solar System” modes which comes into its own early in the evening before all the stars become fully visible. The NexStar SkyAlign system can get up and running with just two objects, and then it tracks to whatever target you desire, sometimes before you can even see them with the naked eye. By the time the heavens become fully dark, the Celestron NexStar 4 SE telescope is already on task and delivering the goods to you. Where can I buy a Celestron NexStar 4 SE Computerised Telescope? This Maksutov Cassegrain telescope is excellent for beginners or experienced astronomers, because the wonderful automated control system makes it easy for everyone to enjoy the fun parts of astronomy, rather than fussing with the technical aspects of operating your instrument. The Celestron NexStar 4 SE does the hard part for you, and makes it easy for you to observe the universe. 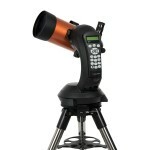 Click Here to read more about the Celestron NexStar 4 SE at Amazon. Thanks for another fantastic and easy to read article. Exactly the type of information I am looking for, and I really want to find the right telescope. Can’t wait to get started viewing the planets from my backyard. Thanks Again.